Taste more of Indonesian food by adding some galangal in your dishes and it is also good for your health. Beside that galangal an important spice in the Indonesian kitchen, they have also a lot of health benefits of this rhizome family. We use this spice frequently in our dishes. It’s almost in every Indonesian dishes that you’ll find this underground stems. It has a lot of varieties and flavor. The type we know in Indonesia as “Laos or lengkuas” has ivory white flesh and mild sharp sweet taste. 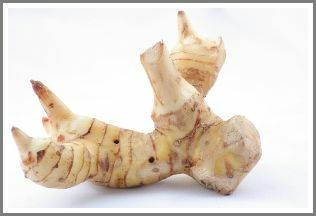 And we have also lesser galangal, better known in Indonesia as “kencur” has very strong flavor. To better known about this spice, see my other page about this strong spice. Laos is less sharp than kencur. It has a fabulous taste especially if you use them for yellow rice. You can taste it clearly through all the spices. This remarkable spice is also a good source of sodium, iron, vitamin A and C. And according to research galangal has benefits in certain inflammatory conditions. It can be stored in the freezer for a few months if you’ll keep it fresh. Just cut it into pieces and take them out when you need them. You can also use dried form for your dishes, but I don’t really recommend that. They lose a certain taste. They are good enough to make some tea; it can be use to calming your body. Or you can make a paste of them and rubbed into your body or wound to ease the pain. But to cook Indonesian food, use fresh or frozen spice. If you can’t find the fresh one in your city, there is a possibility to buy it online. Just take a look of the offer above. But I suggest you to look further in your neighborhood or other nearby city to get fresh products. It’s take a few days before you get them if you’re order it online. If you're really can't find it, it's ok to buy it online. This spice is not so fast in rotten; you can keep it good for a few days outside refrigerator. And if you order it online, cut it in pieces as soon as you get it, and put them in the freezer, so you can keep them good for a few months. And there are so much recipe that use this spice, see for more on Indonesian Recipe. Enjoy cooking with this flavor spice.